Every child loves growing carrots, and we all have a child in us! It's never, not ever, been known for a child, or anyone to resist the urge to bite into a freshly pulled, sweet carrot from the garden... well... possibly washed first. 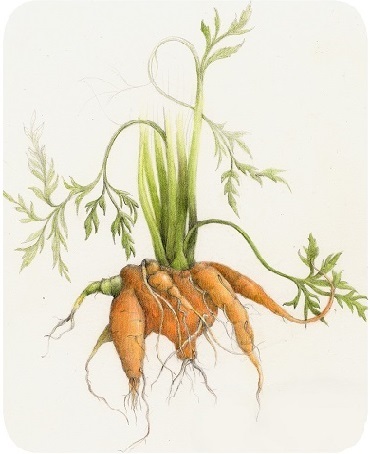 Carrots (Daucus carota subsp. sativus) are biennials, so they grow the first year and produce nice edible roots, then if left in the ground too long over winter, come early spring, the roots will harden and all goodness will go into producing a long flower stalk. Once seeds appear and dry, the plants will die. Originally from Europe, they were cultivated 5000 years ago in the Mediterranean and Afghanistan. High in nutritious beta-carotene, Vit A and many other vitamins and minerals. Carrots will grow where others fear to grow. Which means they're rather cavalier about the weather and pretty much anywhere will suit them. A sunny spot, with even some early or late shade is fine. To develop sweet tasting roots, they do prefer to be in cool soil, so water and mulch well in summer, or wait and grow them in the cooler parts of the year. Carrots can be left in the ground over fall and even winter, but get them out before spring otherwise they will go to seed and be woody. Seeds can be sown late winter, but it's best to let the last frost bite, before sowing. As the soil starts to warm in spring, your little carrots will spring forth and enjoy the first rays of summer. Successive planting every 3 weeks can be made until early autumn for an ongoing crop. Because carrots are a root crop it's best to sow directly into the ground, rather than transplant seedlings from a tray. Make a shallow depression, walk along with your feet or shoes, and scatter seeds thinly on top of this wide row. Try and space out the seeds to 3-5cms. A common idea is to plant carrots thickly, or plant radishes amongst them. This is so you can pull out the young carrot thinnings or the early maturing radishes for eating. I don't like to do this because it can disturb the remaining carrots unless you're very careful. But if you do want to do this, make sure you water the remaining carrots well afterwards to settle them in the soil. Sprinkle fine sand very lightly over the seeds, barely covering them. You don't want any sort of soil on top that may compact and stop the tiny seedlings from pushing up. Water well with a gentle sprinkler and keep well moistened until the seeds have germinated in 2-3 weeks, and are 1-2cms high, then you can slow down the watering, and even let the top soil layer dry somewhat. Soil preparation is important... don't plant carrots in a fresh no-dig or composted patch. Carrots hate lumps, stones, clods of clay or clumps of uncomposted material. So to avoid your carrots going mental with forked or twisted roots, have the soil finely tilthed at least to 20-30cms down. Carrots will thrive in light, well-drained, fertile soils. Fine leaf mold, or plenty of very well-rotted organic matter added a few months before planting is excellent. Like all root crops, you don't want to encourage too leafy tops, so go easy on any nitrogen fertilizer. Soil should not be too acidic, and a soil pH of 6.0--6.8 is good. Traditionally the modern carrot is long and orange, but have fun with some of these short, fat, purple, white, and yellow varieties. 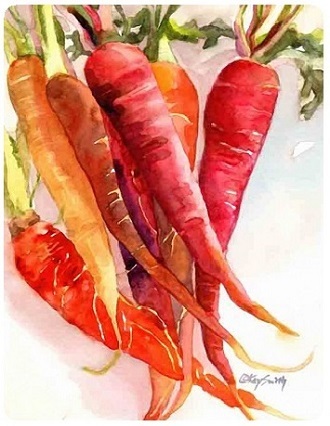 Colored carrots, especially purple ones, tend to lose some of their color when cooked. Atomic Red: A bright fiery red carrot which grows to 22cms (9") in 76 days. Chantenay: An old favourite, short and stocky. Early-maturing, but develops extra sweetness in cold weather and is good to keep in the ground over winter. Cosmic Purple: A dark reddish purple variety with orange core. Danvers: A Popular juicing carrot that stores well. Imperator: Nice and long. Must have a friable, loamy soil to be able to stretch its leg(s) down. Lubyana: A gorgeous golden Slovenian heirloom carrot. Lunar White: An almost coreless, crunchy carrot with a mild flavor. Takes 60 days and grow to 20cms (8"). Manchester Table: A reliable old-timer. Great flavor for winter meals. Miniature: This little carrot is good to grow in difficult soils such as clay. Nantes: An old favourite, tasty and dependable. Grows rapidly and copes with most soils and climates. Purple Dragon: Bit of a novelty carrot, small, 15cms (6") but fun to grow. Takes 65 to 70 days. Purple Haze: A deep purple carrot, similar to the original color of carrots cultivated in Afghanistan 5,000 years ago. Has a slightly orange core. Red Samurai: Scarlet-colored surface with pink inside. Very attractive. Solar Yellow: Totally yellow, with 18cms (7") of very sweet crunchiness. Takes 63 days to maturity. Yellowstone: Known for its sweetness and smooth skin. Rotating your carrot patch every 1-3 years is a good idea to help combat insect and nematode attacks. Different pests, like rabbits and other furry 4-legged animals will need fences, screens or other barriers to keep them away from chewing your carrot tops and/or digging up the roots. The nasty sounding root-knot nematode is a common carrot pest, and it will deform the roots. A popular way to clear nematodes from your soil is to use solarisation. This means putting clear plastic over the empty affected area and let the hot sun bake everything underneath over a summer. Carrot rust fly can be a nuisance, putting it mildly. These little blighters lay their eggs next to carrot tops in the soil. 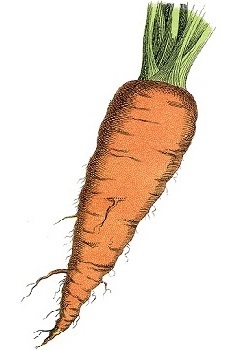 Once hatched, the larva wriggle down and eat tunnels into the carrot's roots. Same with carrot weevils. Aster yellows phytoplasma, usually caused by the aster leafhopper, will ruin carrots by making them hairy, misshapened and tough. Growing under floating row covers is a popular way to deter these insects. To stop the shoulders of carrots going green and bitter, be sure to cover the whole root with soil. Sunlight exposure will cause them to turn green from developing chlorophyll. If your carrot roots split down the sides, it's probably due to inconsistent watering. Carrots that are go through a long dry period, then get lots of water will swell up and crack. Try and give about 3cms water each day if it's hot and dry, and a good soaking once a week. Remember mulch will help keep the moisture in and the soil cooler. Roots are prone to splitting also when they're left in the ground once mature and the weather is still warm. Short, stumpy roots happen when the soil gets too warm, around 70°F plus. Warm soil also produces bitterness in carrots. There again, plenty of water and mulch is needed, or wait for cooler weather for growing carrots. Hairy carrots can happen if you over-feed with a high nitrogen fertilizer. When to start tucking into your carrots will depend on the variety you have, but it would average between 45-75 days from seed. Baby carrots can be ready in 6 weeks, whilst some large late maturers take up to 16 weeks. Your seed packet or guide will tell you when to start picking for the variety you're growing. You can poke around the soil at the top of your carrots to check if they're big enough. Taste testers and research shows that for the best flavour and most nutrients, cook your carrots whole. Give a light scrub then steam, bake or roast, until tender, then cut up to serve if you wish. I'm partial to a nice raw carrot, and grating carrot over the top of food, or in salads. Carrots are good for you, and will provide different nutrients when eaten raw and cooked. How to store carrots: To keep carrots from losing their sweet crunchiness, remove the leaves, once harvested. Store in a cool, dry and dark place, or keep wrapped in fridge. How to freeze carrots: There's raw carrots, and cooked carrots, then there's... um.. frozen carrots. Yes they are rather bland, but perfect to scoop a handful into a stew, so it's worth having a bag or 2 in the freezer. To freeze, slice carrots and blanch in boiling water for approximately 5 minutes. Plunge into cold water — ice cold if possible, then into freezer. See more at freeze vegetables.